"These muffins are so tasty. I add extra bananas and decrease the sugar. They are healthier and still good." Preheat oven to 375 degrees F (190 degrees C). Lightly grease 10 muffin cups or line with muffin papers. Mix 1 1/2 cups flour, baking soda, baking powder, and salt in a large bowl. Beat bananas, sugar, egg, and melted butter in another bowl. Stir banana mixture into flour mixture just until moistened. Spoon batter into prepared muffin cups. Combine brown sugar, 2 tablespoons flour, and cinnamon in a small bowl. Blend in 1 tablespoon butter until mixture resembles coarse cornmeal. Sprinkle topping over muffins. Bake in preheated oven until golden and tops spring back when lightly pressed, 18 to 20 minutes. 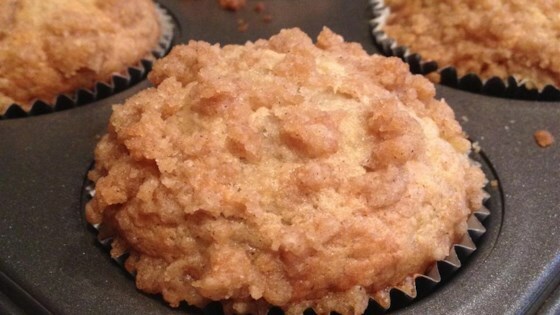 This recipe is a healthier version of Banana Crumb Muffins. I didn't make the crumb topping so this is for the muffin itself. There's too many bananas. It kept the center from baking properly. The muffin had a weird rubbery/eggy/spongey texture. Had the recipe not said "healthier" I doubt I could've detected the difference! Moist, and a tender crumb bursting w/ banana flavour! Best receipt I've tried so far. Used more cinnamon, and added lots of whole oats to the topping. They're gone in a day here!